In this document, we will describe how to monetize your Dub parking site, by placing advertising items. Advertising items are managed through Dub Ad Manager. 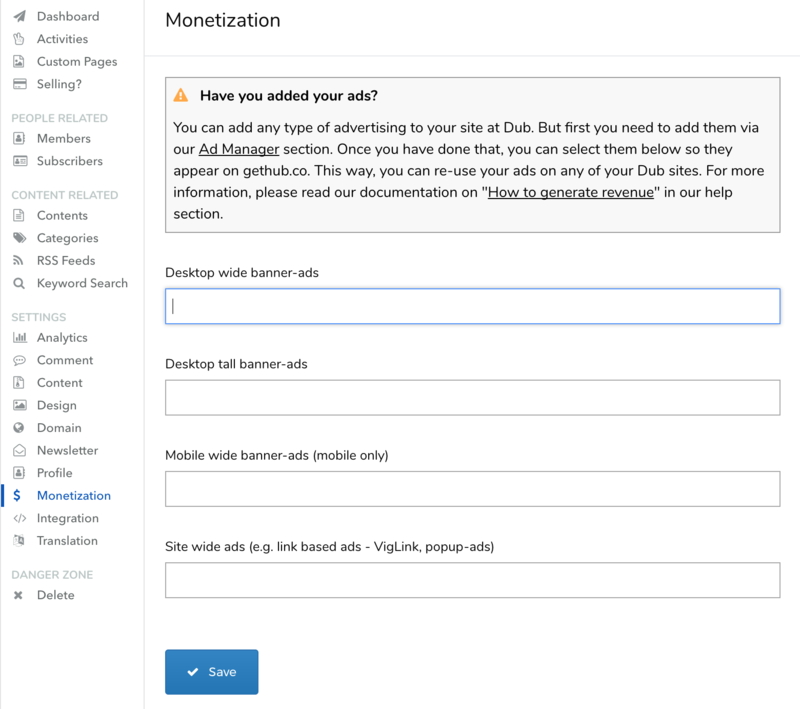 So if you haven't done so already, please read our documentation on Ad Manager. The basic process is you add/remove/update advertising items via Ad Manager and then select which ones to add via Monetization settings page within your parking site's admin panel. By managing advertising items through the ad manager, you can re-use your ad items on multiple parking sites and parking pages. Click on Monetization under the Settings and you will see the below screenshot. You will see that there are input fields for various ad space types. For example, Desktop Wide Banner-Ads refer to a areas within your parking site where a horizontally wide and vertically short advertising items are suitable. In many advertising platforms, you will be able to select an advertising item which would be suitable for this area. The Desktop Tall Banner-Ads, as the name suggests, are suitable for a vertically long and horizontally narrow advertising items. Mobile Wide Banner-Ads are ad items that are displayed only on mobile devices. Finally, Site Wide Ads are a type of advertising which is applied globally throughout your parking site. For example, VigLink is an ad platform which turns all your links into a potentially viable affiliate links. This isn't an area-specific ad-item, so it needs to be placed in a special area. Once you're happy with the selections, click Save and the advertising items will start displaying on your parking site. You can select as many advertising items for each area as you wish. Dub will display one ad item at a time rotating through the list of ads that you selected. We also strongly recommend that you read all the Terms and Services of the advertising platform that you're using. Some of them have quite strict rules as to where you can place your ads. Lastly, getting the right advertising items on your parking site can take awhile to settle. So we encourage you to experiment with various ad platform and ad types. Remember, ads are often frowned upon by your visitors, so you do not want to annoy your visitors by having too many items.